One of the main problems encountered in modern vacuum tube design is a great lack of available information. A good example of this is the data available for power amplifier tubes. Often times all that is available is a data sheet, some simple design point information, and maybe some plate circuit characteristic curves if we're lucky. If someone wants answers about using the tube at a different operating point than that referenced in the data sheet they're pretty much out of luck. And it's not like today, we can simply pick up the phone and call RCA or GE and start asking questions about vacuum tubes. We modern tube circuit designers are on our own. Anyone that knows me also knows that the 6V6 is probably my favorite power pentode to be run in the "Ultra Linear" or "UL" topology. This is especially the case when Single-Ended (SE) designs are considered. But I recently came to realize that I didn't really have the data I needed to intelligently choose an operating point for my designs. In the past, I have simply been using pentode design points off the data sheets, because the DC bias calculations for UL and Pentode operation are the same, and hoping for the best in dynamic UL operation. There has to be a better way. So I decided that I should perform some investigations of the 6V6 in SE-UL operation and see what I could find out. Now in fairness, there is "some" information concerning the 6V6 in UL mode available on the internet. However, the majority of this information is focused on push-pull configurations and finding the "optimum" point for the UL taps on the output transformer. In addition, a comprehensive set of data concerning biasing the 6V6 in UL mode simply does not exist. Today, we know that the proper UL tap position for minimum distortion is approximately 40% to 43% and today most commercially available output transformers use approximately this tap point. But we still don't have the critical data we need outlining the operation of the tube in this configuration. This lack of bias and operation data is the problem which I endeavor to address. The act of deciding how to go about these investigations was not nearly as simple as one might assume. As I said, I wanted to look at the operation of the 6V6 in SE-UL topology. But I needed to decide on an approach that makes sense for builders today. I decided that what I would do is settle on one load transformer and then investigate the operation of the circuit at different plate voltages and bias levels. I also decided that I would utilize a cathode bias circuit as this topology is inherently lower distortion than a fixed bias approach. Following a little experimentation I settled on a 5k plate load. These decisions resulted in the test circuit shown below. This circuit uses an Edcor GXSE10-8-5K UL transformer as the load for the power tube. The transformer is terminated with an 8 ohm resistive load. For bias adjustment I used a 25W 1 k-ohm rheostat bypassed with a 200 uF capacitor which allowed me to set the bias at each operating point. The resistors Rsp and Rss are 1.5 ohm sense resistors so that I can measure screen and plate currents at each operating point. They are small enough that they have no effect on circuit operation. The tube is driven by a 4S preamplifier using a 12AU7, which is driven by my signal generator. The B+ is supplied by my bench power supply, a Heathkit IP-17. The tube used in the test setup was a JJ 6V6S chosen for it typically good performance and inherent ability to handle marginally abusive operating conditions as I adjusted the test setup. Here is a picture of the whole test setup on my bench. The approach to test was simple. Because I wanted to characterize the performance of the 6V6 and not the circuit, per say, I decided that I would control for constant plate voltages, choose several values based on data sheet information and vary the bias levels at these plate voltages to see how the tube performs. Looking at the various data sheets, I decided on the following five values of plate voltage (i.e. the DC voltage between plate and cathode pins): 200v, 225v, 250v, 275v, and 300v. Below 200v, the tube is really not capable of much and above 300v is beyond the maximum rated voltage for the tube. At each plate voltage I varied the bias voltage and collected data on power out (in the 8 ohm load), harmonic distortion, plate and screen dissipation, and current levels. All data was taken at 1 kHz. Taking the data was fairly simple. I would adjust the B+ voltage to get the value of plate voltage required, choose a bias voltage that was close to max plate dissipation, and then record data on tube operation. In the determination of performance at each point, the peak drive voltage was set equal to smaller of either the bias voltage or the cutoff voltage. Then I would raise the bias voltage (i.e. increase Rk) and repeat until the distortion raised above 5% or some other performance parameter got to an unacceptable level. The process should become clearer as the data is presented. 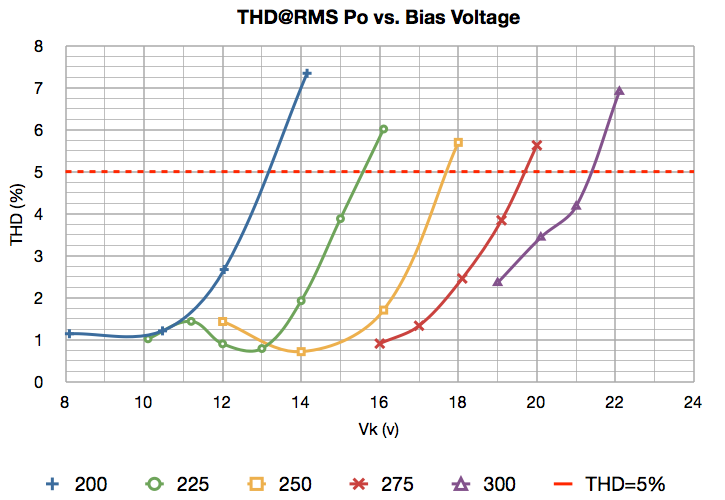 The first piece of data, and the one in which most people are probably most interested, is the RMS power output verses the bias voltage. This data is shown below. 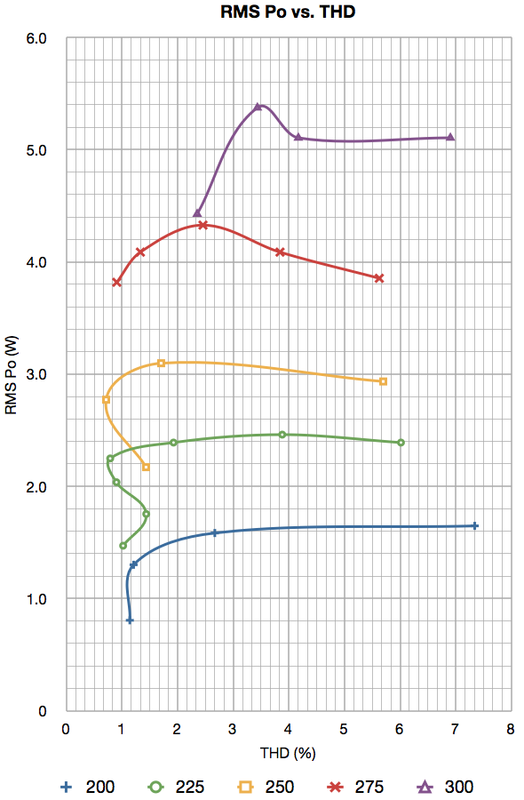 This data set shows how the maximum RMS output power delivered to the load (as measured at the actual load resistor) varies with bias voltage at each of the chosen plate voltages. Because plate current increases as the bias voltage is reduced, the maximum plate dissipations are represented by the left most points on each curve. Examination of this data clearly shows two very interesting points. The first is that the optimum power out is primarily driven by the chosen plate voltage. 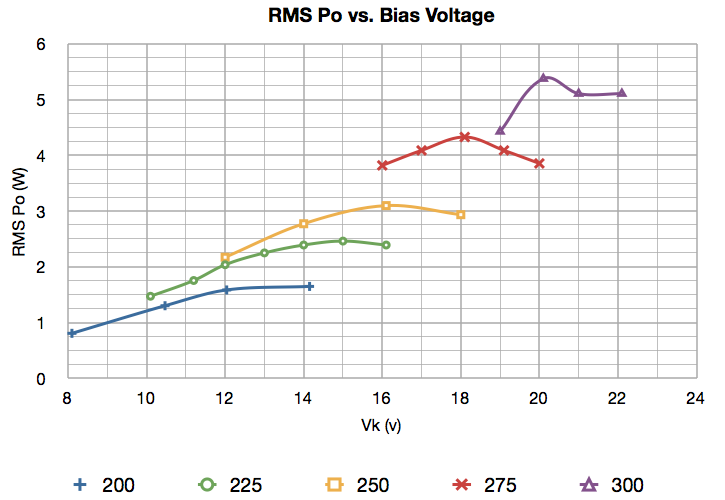 Variation in bias voltage at a given plate voltage really doesn't have a great effect on peak RMS power output. 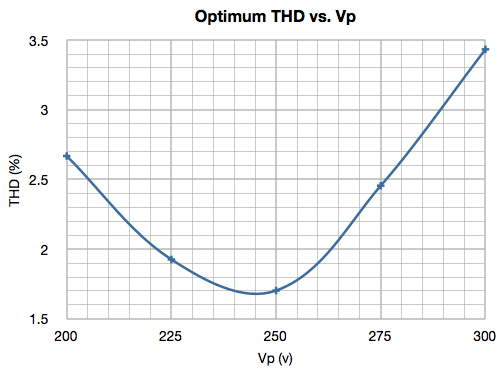 The maximum variation being less than 1.5 dB except for the lowest bias voltage points on the 200v and 225v curves. The second point illustrated is that there is a bias voltage "sweet spot" for each of the plate voltage curves with respect to the power out. This tendency becomes more pronounced as the plate voltage rises. The next piece of data, which is of as much importance as the power curves above, is the distortion data. The following plot shows the total harmonic distortion in percent, verses bias voltage, at each of the chosen plate voltages. This data demonstrates another interesting trend. There appears to be a minimum distortion bias for each of the three lower plate voltages. These minimum points probably also exist for the upper two plate voltage curves, however in these lower bias voltage ranges the tube is plate dissipation limited. What this data also clearly demonstrates is that at each plate voltage level, it is possible to achieve a reasonable distortion level at the maximum output power point. For example, at 275v plate voltage, the 18v bias that gives maximum power output also achieves this with only ~2.5% THD. This is good to know. A different way to look at this data is to combine the two data sets and plot the power out vs THD levels for each plate voltage. The importance of such a plot is that in most instances, the design process comes down to performing trade offs between lowering distortion and raising power. This plot puts them together so we can see exactly how they interrelate. This plot immediately throws the power verses distortion relationships into clear perspective. Lower distortion is to the left, higher output power is toward the top. This plot is the first that actually allows us to begin to make some decisions. At each plate voltage level it shows a similar trend. There is clearly a trade to be made of power verses distortion at the lower distortion levels, but for each plate voltage, there is a clear point of diminishing returns. Above this point on each curve, distortion greatly increases with no meaningful increase in peak output power. Before we make use of this data, there are two other data sets that need to be evaluated. These are plate and screen power dissipations verses power output and plate and screen currents verses power output. This power dissipation data is especially important for the 6V6 family because of the two types of tubes available. The original 6V6/6V6GT (and the 7 pin 6AQ5/6AQ5A, 6005, and 6999) are limited to 12W plate dissipation while the newer 6V6GTA/B/C, 6V6S, and 7408 are limited to 14W plate dissipation. But what this data shows is that, except at very high plate voltages, the tube peak performance points are all below the 12W limit. 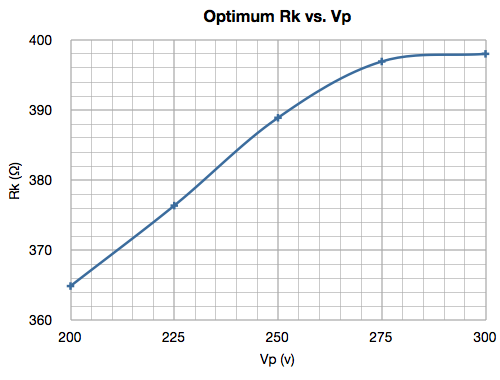 There are however plate voltage limitations on the basic 6V6/6V6GT, the basic 6AQ5, and the 6005 of 250v. The newer 6V6GTA/B/C limit is higher at 300v, the 6V6S has a huge 450v limit, and the 7-pin 6669 tubes have different plate voltage limits depending on the manufacturer. The lesson here is to be sure of the limits on the tube you are using when you pick your design points. The other point of interest concerning dissipation is that at no time did any of the configurations have a screen dissipation in excess of 2w. As such, screen dissipation is not something about which you need to worry when using this data regardless of the tube you choose to use. This low screen dissipation power seems to be a basic characteristic of UL operation. As such, screen resistors should not be required except in very special circumstances. 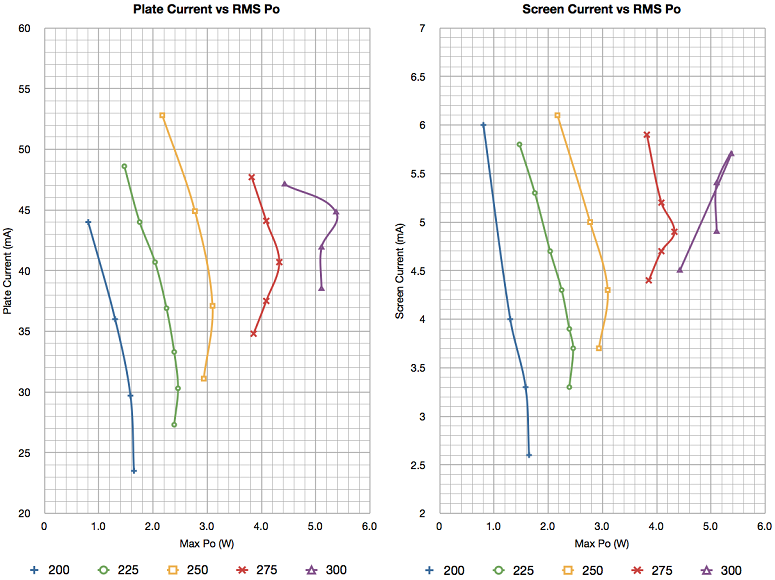 The other data set of interest is the plate and screen current vs power curves. This data is important for power supply design and if you are using smaller output transformers which may have a saturation current limitation. Here is what the data looks like. As can be seen, for the most part currents run under 50 mA total. This is usually well within the limits of most small UL transformers. The other nice thing about this is that, in most cases, 100 mA of total B+ current is enough to put together a complete stereo amplifier. One other thing to which you should pay particular attention is the highest power dissipation point in the 300v data series. The abnormally low screen dissipation and current for this point clearly indicates something unusual happening within the field structure of the tube. Although I cannot currently explain the exact phenomenon, I think it is clear that this combination of high plate voltage and high plate dissipation should be avoided. "Restrictions on operation that must be taken into consideration in the determination of optimum power and optimum load resistance include allowable nonlinear distortion, allowable grid current, available grid circuit input power, and grid and plate dissipation." In large part, what this means is that there is no single optimization condition. Optimization is an act of achieving balance between various factors to best achieve the goals in mind. So when I use the word optimization in this context, what I mean is achieving a balance between distortion and power. Other factors like B+ voltage and current levels I will adjust to get the results I want. 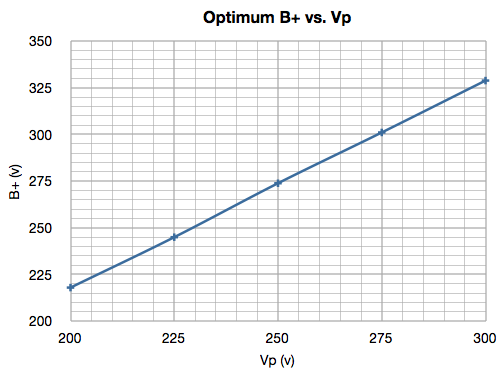 In the optimization data that follows I have chosen from each plate voltage series, a single bias point which I believe reflects the best tradeoff between peak power out and distortion at that voltage. These individual points are then folded into a single data set which represents a set of optimized conditions for the 6V6 operated in a cathode biased ultra linear configuration with a 5k load transformer. 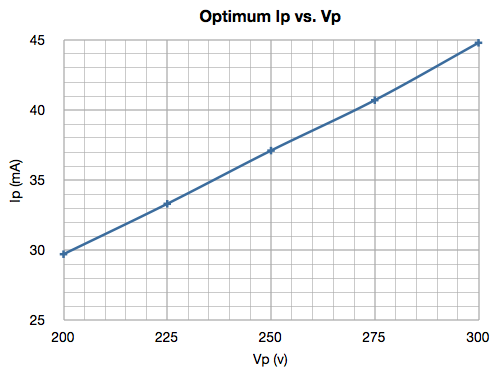 All parameters are plotted against the tube operational plate voltage Vp. Please note that this is not B+ voltage but the actual plate to cathode voltage. This distinction allows this data to be used for a fixed bias configuration as well, with the understanding that the distortions my not be quite as good. I present the data in three different pieces. 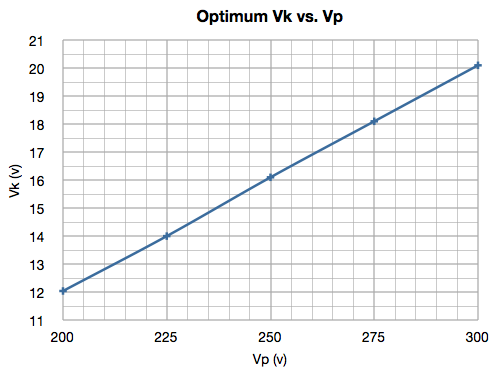 The first, is a plot of the optimum bias voltage (Vk) verses the plate voltage. This plot shows how the bias voltage should be changed as plate voltage is changed. This plot shows that the progression of Vk as Vp increases is fairly linear. I believe this to be a good result because it shows that the optimization point of the tube changes proportionally to circuit voltages. This implies that these optimized operating points really are related to the inherent structure of the tube and not to some chance circuit configuration. The other important thing to note is that the optimized bias voltages are somewhat greater than those generally published for pentode operation. For example Vp=250v and Vk=12.5v for pentode operation from the GE 6V6GTA Nov 1967 data sheet verses Vp=250v and Vk=16v for UL operation above. The next set of plots show how the circuit behaves at these bias points. 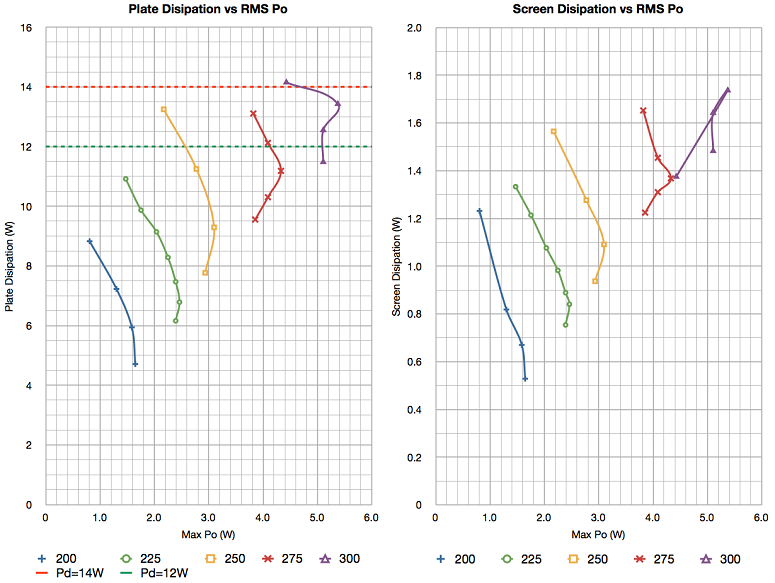 These plots show peak RMS power output at each point, the THD at max power for each operating point, and the plate and screen current levels. Here are the plots. These results illustrate two very important relationships. First is the repeat of the relatively linear relationships between optimized operating points and tube voltages (and current) noted above. 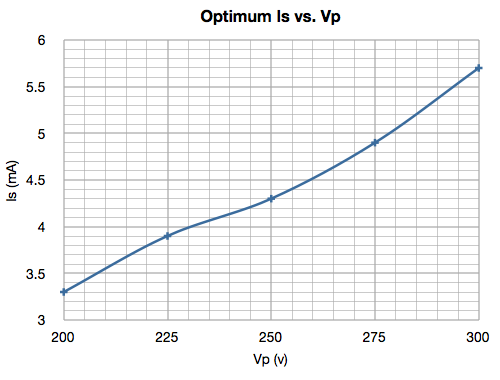 The second is that there very clearly is a global optimization in distortion (for the 5k load) around Vp=250v. This gives us a clear choice of operating points if minimum THD is of primary importance. Especially if using 7-pin members of the family with a 250v maximum plate voltage. The final two plots concern the choice of circuit parameters to achieve these operational conditions. The first is a plot of the B+ voltages used to achieve these circuit conditions. As each bias was dialed in, the B+ was adjusted to ensure that the plate voltage was maintained very closely. In all but one case the B+ voltages at each plate voltage were very nearly constant; within about 1.8v for all bias voltages investigated. 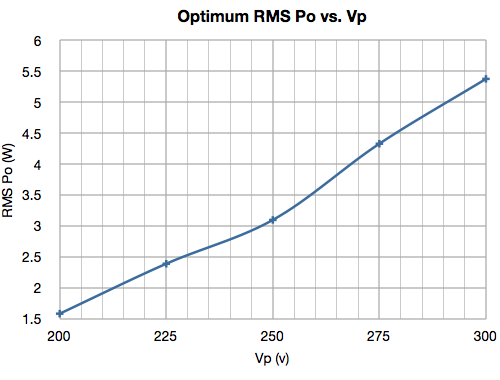 And the second plot shows the all important cathode resistor value at each optimized bias point. It is very interesting to note that value of Rk for optimized operation did not change significantly over the entire Vp range investigated. The total change from lowest (365 ohm) to highest (398 ohm) being only ~9%. And finally here is the data I used to plot the optimized operating curves. So now that I've gone through all this data it's time to decide if I've met my goal. In the introduction I stated "This lack of bias and operation data is the problem which I endeavor to address". After performing this investigation, I now have a complete set of data on how to bias and operate the 6V6 in the SU UL configuration (at least at one load resistance) for my future builds. So I would assert that I have met my goal stated at the off. I also think that I have concluded that running the 6V6 above Vp=275v in SE-UL configuration is not warranted. When going to Vp=300v the difference between 4.3W and 5.4W is only 1 dB, the THD is 36% higher, and I just don't like the screen current behavior at Vp=300v. There is clearly something happening in the tube at this level of plate voltage which doesn't look right. And if it doesn't look right, there is a good chance that the sonic results will be less than optimum. Overall I consider this a successful endeavor. As I start my next design I won't have to just use pentode bias points and hope for the best. I'll be able to consult the data I collected and intelligently chose an operating point that meets my design goals and works well with the rest of my design. My hope is that others will also find this information helpful as they start their own 6V6 SE UL builds.